You know, as of late I’ve been neglecting the whole “old electronics” portion of this blog quite a bit. This was brought into a particularly sharp focus recently by a spate of comments on my older posts regarding the subject. The answer was clear: People like reading about this stuff, but even before that I had noticed that those posts tend to get decent viewership. …Which is good, because beyond longingly gazing at it, I can’t find much other practical use for the beast. You can click on any of these pics for a larger view, which will hopefully alleviate the symptoms of my inability to find a decent viewing angle to snap these shots. (Hey, I did the best I could.) Above is a closer, full-on view of the control panel. Nothing too out of the ordinary; you’ve got your starts, stops, opens, closes, shuffles, and so on. Without closer inspection, one may very well think it’s an ordinary CD or even DVD player. Indeed, Goodwill had this notated as just a CD player on their price tag. That was technically correct, especially in this day and age, but back when it first released, there was a bit more to it than that. Just what is a Photo CD system, and why am I so enamored by it? Wikipedia has a wonderfully detailed write-up on the line, but the short of it is that in the time before digital cameras and DVDs and what have you, the Kodak Photo CD system allowed you to view your photos, your very own homemade photographs, on television. Think of it as an evolution and/or offshoot of the vacation slides people used to bore their friends and family with. So how did you get your sad snapshots from the camera to disc to player? Kodak had Photo CD centers, and much like you dropping off film to be developed (remember when you had to do that? I do! ), you’d take your precious cargo to one to be transferred to CD, and from there, you could view digital slides of all the stupid things you thought were worth archiving digitally – including those embarrassing early-1990s fashions that would soon come back to haunt you somethin’ fierce. It’s the kind of technology that’s so commonplace nowadays, I wouldn’t think twice about burning a bunch of my idiotic photos to disc and watching them on my DVD player (if I had that much time to waste on my hands, and luckily I’m not quite there…yet). But for 1992, this was a neat piece of tech. Unfortunately, the transitory nature of electronics, and the introduction of affordable digital cameras and PC photo formats, and so on and so forth, it all eventually doomed the line, and while it limped along for several years, it was never quite a rousing success. Kodak Photo CD players used their own compact disc format, and while I initially figured maybe burning some JPEGs or something to CD and throwing it in would be enough to properly test the machine, a quick online search told me I was severely mistaken. Apparently there are ways to mimic the format and burn to CD, but a cursory glance at such prospects left my head swimming just enough to where I abandoned the idea. (Besides, I don’t know if that’s technically legal or not.) So, for all intents and purposes, the Photo CD aspect of this unit, the main reason it was put into production, is barred to me. Still, the thing powered up, and aside from the CD-drawer not quite closing all the way without a little help from the user, it appeared to be fully-functional. I have no reason to doubt the Photo CD portion still runs correctly, but near as I can tell, I have no way of proving it. And to make matters worse, upon plugging in and powering on, nothing shows up on-screen, so no neato screencaps for y’all, either. About the only thing I can do with the machine is play audio CDs. 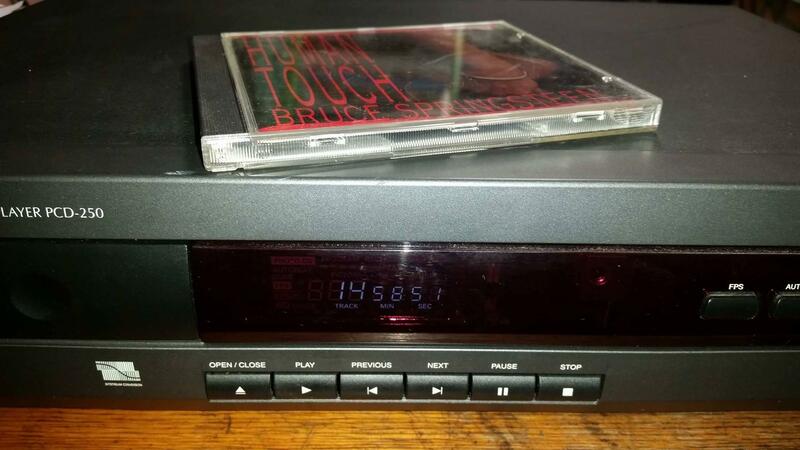 Luckily, I had a spare copy of Bruce Springsteen’s Human Touch lying around, and what better way to test a 1992 piece of technology than with a 1992 album? So in it went! Above: You can see the player gives a readout of the total CD running length, as you’d expect, and it does run audio pretty well. Human Touch sounded really nice while playing here; there was an odd, I don’t know, kinda ‘thumping’ sound on what seemed to me to be higher notes, but for all I know that was just a result of the chords I was using. I could have listened to the whole album this way and not been bothered, so obviously it was a pretty minor issue. Maybe the lens just needs a cleaning, I don’t know. I suppose it doesn’t really matter though, does it? Around the back of the machine, you’ve got some standard inputs and outputs. RF out, antenna in, your red-white-yellow jacks, a channels 3 or 4 selector, and the part I found most interesting, an S-Video jack. S-Video was around, obviously, but I don’t think it had quite become an industry standard yet, so to see it implemented by Kodak was a nice touch. Hey Photo CD system, you’re on the same page as Super Nintendo! Well done! Next: Hooray for poorly-lighted and too-blurry photos! This isn’t the kind of thing I’d want playing on my Photo CD system! Still, there’s your proof: October 1992. Did you think I was lying? I wasn’t. Geez man, October 1992; I was all of six-years-old! I didn’t even have my Super Nintendo yet! (That would come at Christmas ’92.) Maybe one of the coolest things about picking up old technology like this nowadays isn’t so much what it can or can’t do, but rather it’s the ability to look back and realize this was what was cutting-edge then! Sure, it’s been hugely, hugely supplanted in the years since, but like I said before, that’s just the transitory nature of the beast. So there you have it, the newest addition to my big giant stack of electronics: A Kodak Photo CD system from October 1992. I can’t really do much with it, except play audio CDs (and I’ve got plenty of other devices that can handle that), but as a piece of early-90s tech, I still like having it. I can’t promise I’ll ever do much more with it, and I’m a little disappointed I can’t (easily) play photos on it, even if for no other reason than to be as arbitrary as possible, but for only $5 I say it was still worth adding to my pile of junk electronics collection. 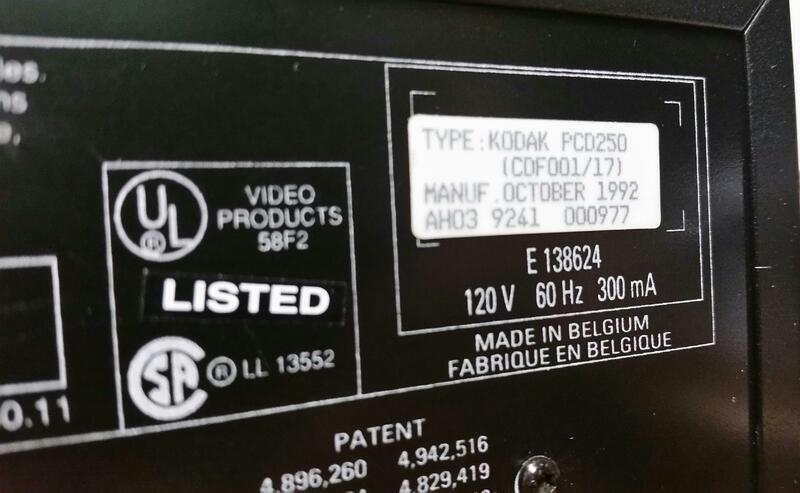 This entry was posted in Uncategorized and tagged 1990's, 1992, 1992 electronics, 1992 technology, electronics review, kodak, kodak pcd-250, kodak pcd250, kodak photo cd, kodak photos, october 1992, old, overview, pcd-250, pcd250, photo cd, photo cd pcd-250, photo cd pcd250, photo cd system, review, vintage, vintage electronics, vintage technology on August 4, 2017 by neovideohunter.